Interfaith leadership is an essential building block of peace in the twenty-first century. Faith traditions differ in belief and sacramental practice but share a common mission to advance moral and ethical standards of conduct, cultivate virtue and uplift human character. This “civic mission” forms the common ground of all faiths. The voice of faith leaders in the public square is essential in affirming the transcendent values that are the foundations of law, just government, and peaceful coexistence in diverse societies. Leaders such as Dr. Martin Luther King, Jr. and Mahatma Gandhi advanced historic movements of reform by moral authority grounded in spiritual principles. Addressing the most critical challenges facing humanity, including conflict and corruption, requires more than political agreement; it requires a collective moral will. The Global Peace Foundation encourages people of faith from all traditions to rise above sectarian perspectives and work collaboratively to advance peaceful reconciliation, provide care for those in need, and foster healthy human development. The Interfaith Leadership Award recognizes individuals who are leaders of interfaith collaboration, showing by example that it is possible to transcend differences based on shared values and our common heritage as one family under God. Rev. John Joseph Hayab and Sheik Halliru Abdullahi Maraya are Christian and Muslim clerics from Kaduna State, Nigeria who are working to build bridges of tolerance, understanding and respect across religious divides in one of the most volatile conflict regions in the world. Affectionately known as the “twins of Kaduna” for their close personal relationship, Rev. Hayab and Sheikh Maraya have served as principal facilitators in forums and workshops throughout Kaduna State as leaders of GPF Nigeria’s “One Family under God” campaign. Reverend Hayab is the Secretary General for the Christian Association of Nigeria’s Kaduna state office and CEO of the Christian Awareness Initiative of Nigeria. 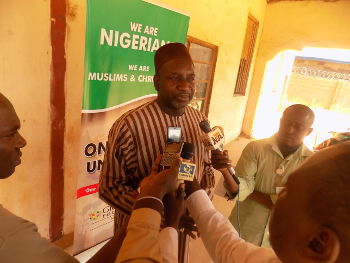 He is formerly Special Adviser to the Governor of Kaduna state on Religious Matters. Sheikh Maraya is a teacher and prominent imam heard on television and radio, and formerly the Special Adviser on Islamic and Hajj Matters to two Executive Governors of Kaduna State in Nigeria, the late Sir Patrick Yakowa and Alhaji Mukhtar Ramalan Yero. By modeling spiritual leadership beyond sectarian identity, the twins of Kaduna have measurably advanced peace and inspired Christians and Muslims in Nigeria and around the world to affirm fundamental shared values.